Join us at Spirit Communication Park! Join us on July 17th at the Columbia Fireflies game! Spring is finally here and the teens at Palmetto Place could not be more excited! It might be the promise that spring break is around the corner and warmer weather is on its way, it might be the fact that our local college teams are in the NCAA Playoffs. For those who love basketball, spring is not just the season that follows winter. For them, spring marks a start of the March Madness and offers another shot at predicting the perfect bracket; a task that has remained unaccomplished throughout the entire history of the NCAA Men's Basketball Tournament.The excitement and buzz of March Madness bonds communities together behind their favorite teams. Every year, millions of Americans make predictions for all 67 games included in the season and fill in their brackets; all hoping they have created the first ever, perfect bracket. This year the University of South Carolina is part of the big dance and we’re hoping to cheer them on at the championship game on April 3rd! We’ll be celebrating the championship game at the Buffalo Wild Winds on Devine Street in Columbia and hope you’ll join us for an Eat Wings, Raise Funds event! Tell your server that you and your friends are celebrating with us and Buffalo Wild Wings will donate 10% of your meal to Palmetto Place. So, come out and see for yourself exactly how Palmetto Place celebrates March Madness. There’s not an easier way to support your championship pick AND the kids Palmetto Place than to enjoy Buffalo Wild Wings' legendary atmosphere and delicious gameday food! For more information regarding our celebration, visit our Facebook event. The first day of spring is right around the corner and our kids can't wait for warmer weather to do more activities outside! The door is open to a child being carried in because he was rescued from an abusive environment with only the clothes on his back – no shoes - no coat – no one that he knows to receive him. This is common place at a children’s shelter. In a 12 month period, 3219 children entered foster care in the state of South Carolina! These children arrive at Palmetto Place and Nancy K. Perry Children's Shelters at all hours of the night and day. Some are hungry and dirty. Some are sick, or have injuries requiring medical treatment. All are emotionally traumatized and in need of much more than a roof over their heads to make them feel safe again. They have suffered abuse, neglect, or abandonment, at the hands of those they most trusted. Palmetto Place Children’s Shelter is a safe haven for abused and neglected children and homeless teens throughout the state of South Carolina. Children are provided a safe and nurturing environment where they have access to after-school programs, tutoring, recreational and social activities. Services are provided that concentrate on personal healing and development including medical attention, mental health care, crisis adjustment, and transitional counseling. Children are given the opportunity to succeed by receiving support to improve their grades and to stabilize their behaviors. All children’s shelters have one main goal, to make a difference in the life of each child who come through the door. 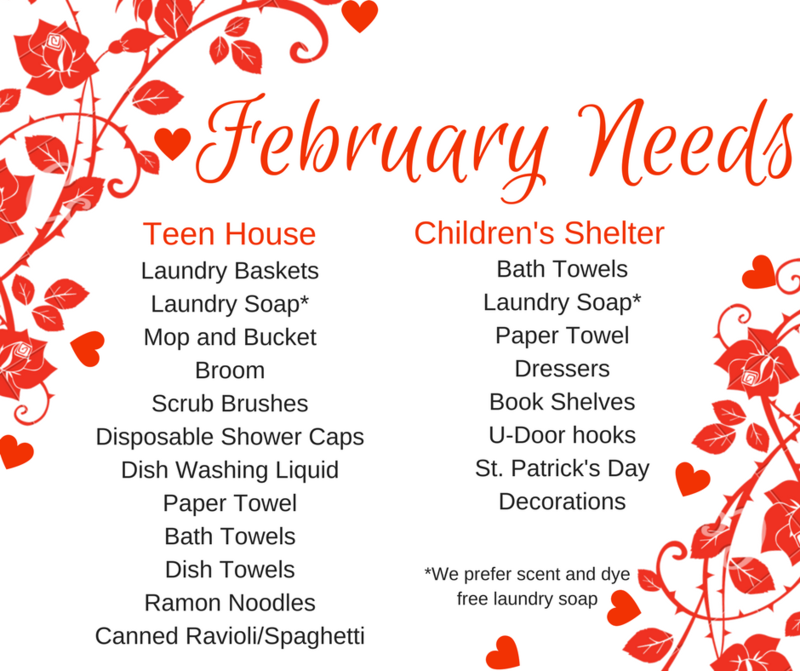 You can help the Dream Makers of GFWC-SC support these two great shelters and make a difference in the life of a child in crisis. 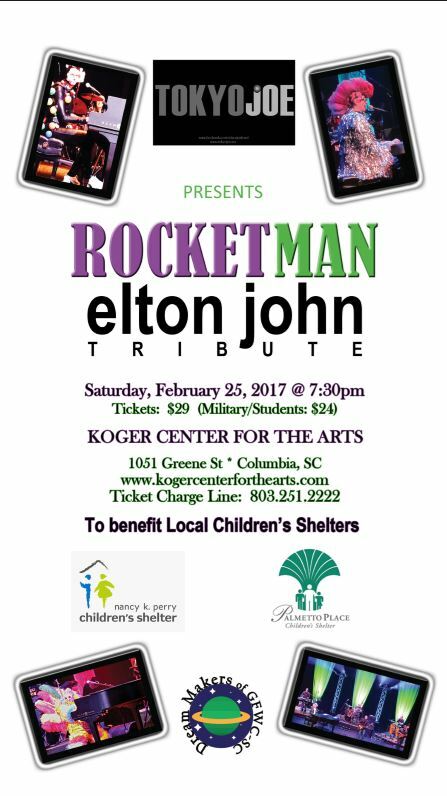 Join them on February 25th as they present an Elton John Tribute Concert by Tokyo Joe Productions benefiting the Nancy K Perry Children's Shelter and Palmetto Place! 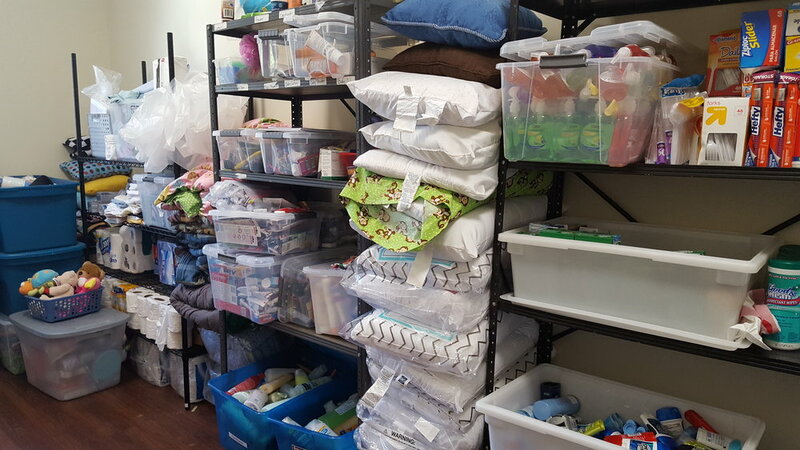 Last month we didn't have much on our needs list- the donations we received in November and December had completely filled our storage spaces! But, we use more than 25 rolls of paper towel 5 gallons of laundry detergent each week! 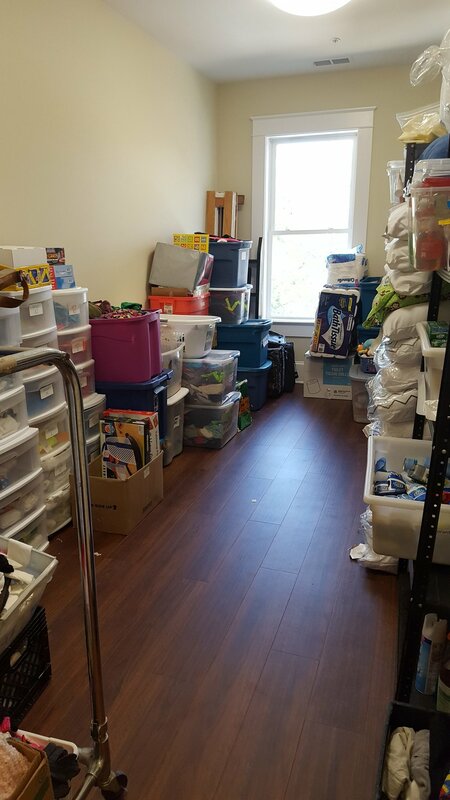 In January we used a good bit on the items that were donated in the months before. *We prefer scent and dye free laundry soap. We've said it before and we'll say it again, we wouldn't be able to give children and teens a safe, loving home without the support of the community behind us. We are incredibly thankful for Walmart #4506, or as most of us know it, the Walmart on Killian Rd here in Columbia. For the second year in a row, they have chosen to support Palmetto Place. Since 2012, Walmart #4506 had donated $5,000.00 to our shelter. This money is used to provide healthy meals and snacks for the residents. Between the two houses, we serve 32 meals and 18 snacks each week during the school year and even more during the summer months. Walmart awards grants to local organizationsmaking a difference on key issues in communities where Walmart Stores, clubs and distribution center associates live and work. In FY15, over 46,000 grants equaling more than $47 million were provided to organizations, including law enforcement agencies, fire departments, schools, recreation centers and more. Every year January rolls around. It's nature's reset button on life, a chance to put the last year behind you and start the new year off right. One of our favorite things about January is making resolutions with the kids. They are so young, full of hope, and their resolutions are inspiring, so we wanted to share a few with you. Michelle, our soon to be 9-year-old, resolved to be a doctor. Despite explaining that a new year's resolution is usually something you want to do in the coming year, this stayed first on her list and there was no talking her out of it. Her other resolution is to join a sports team- maybe soccer (even though she doesn't like the soccer ball) or maybe volleyball. Our teens resolved to "be more fit", love their bodies, and stick with their workout groups. They have started getting together each night before dinner to do some quick workouts. They encourage each other to hold that plank for a few more seconds and do just one more push up. They have even started taking turns leading the groups too! There were lots of resolutions to get better grades, pass their classes and be more organized, but one teen's resolutions hit our hearts hard. She wants a better relationship with her family, to go home and feel loved, but she also wants to give back to her Palmetto Place family for being there when she needed it most. She's a reminder of all the kids who have lived at Palmetto Place who consider our staff, volunteers and other residents family. Palmetto Place has seen 40 new years and more than 7,000 children and teens since it's founding. Here's to another year full of love and laughter. Happy 2017! I am sitting at a coffee shop this morning for the peace and quiet that is needed to write this heartfelt thank you and farewell. It is a Wednesday, the day I am at our teen house early to see the teens each week before they head off to school. One young lady wanted to wear her pajama pants to school. One young man was helping another with his tie for his ROTC uniform. One left before I got there –driving his own car to school. (the car was given to him through a partnership with the Foster Parent Association) One wanted to talk about his family member who passed away suddenly last week. Two of our college girls were sleeping in, their classes didn’t start until late morning, so I peeked under the quilts to say hi. This morning has been my life for the past five years. Not just my job, but my life–the life of my family and friends, who have listened to every success story, every heartbreaking story, every life story of every kid who’s come through Palmetto Place. That’s about 500 kids and more than 500 stories in my five years. When I arrived at Palmetto Place, we had one well-loved old house. We had 10 or so kids, mostly elementary school age or younger. We had a brand new strategic plan that suggested we build a new house by 2018. Now it’s 2017. We have a brand new old house that is just as loved as before, with the homey feeling of the old house and the clean lines of a new house. We have a second house just for our high school and college students. We have more than 30 kids who call Palmetto Place home. It took a village to make all of this happen. We couldn’t have done this without you. Each of you has contributed in some way–time, talents, financial contributions, furniture, clothing and so much more. Thank you. Thank you for what you’ve done, for the house you’ve built, for birthdays, high school graduations, cars, vans, prom, cheerleading camp, Christmas and everything in between. Thank you for sharing the Palmetto Place story with your family and friends and bringing more gifts to our kids. Thank you for listening and thinking about how you could help. Thank you to our staff for loving and caring for our kids in a way that real family does–and for a long time after kids have left Palmetto Place. Thank you to our board members for incredible leadership, for vision, for taking risks and for wanting to do more and for wanting to do what’s right for kids. Palmetto Place has changed my life, changed who I am and changed how I see the world. This organization and these kids have raised my expectations of human beings – because I’ve seen true giving and selflessness. But now, it’s time for me to pass the reins on to another leader. It’s time for me to find a new challenge to take on. That new challenge will be serving as the CEO of the Palmetto Association for Children & Families. PAFCAF represents the organizations in South Carolina who care for children who have been abused, neglected or are medically fragile - and work to promote the best care of these children. Leaving Palmetto Place was an incredibly difficult decision but it’s an opportunity that won’t come around again for me. I’m not going far–my office is in Columbia and you’ll see me at Baubles & Bubbles, Sweet & Savory and the golf tournament. The kids will still see me lots of Wednesday mornings before they go to school. I leave with a full and grateful heart and look forward to telling the stories of kids across South Carolina and doing more for children and families. Farewell, my friends. Thank you. So, farewell and thank you to all of you for the many gifts you’ve given to Palmetto Place and to me. I will miss all of you but your work for Palmetto Place will continue. There will always be kids who need you. Save the Date for April 27th, 2017! Help us celebrate 40 years of service at Sweet & Savory! Our annual chef's competition is the only event where you can find sweet treats and savory hors d'oeurves from the Midland's most talented chefs! Join us for a night of tasty treats, live music, and friendly competition. Let your inner foodie out and be the judge - vote for your favorite sweet and savory dish! Tickets are $40 for individuals or $75 for couples. You can purchase tickets at the door or online. To purchase individual tickets click here. To purchase couples tickets click here. Attire is everything from business attire to cocktail dresses, suits to khakis & polos. Palmetto Place has cared for more than 7,000 children and teens in the last 40 years. We are a safe haven for teens who find themselves living on the streets with no one to turn to and children who have been abused or neglected. We provide love and support and give our residents an opportunity for a brighter future. Despite the tragic stories, our home is filled with the laughter of new friendships. It's where teens learn to drive, get their first job, and go prom. It's where kids make the honor roll, play in the park and have the chance to just be a kid. Palmetto Place is home and family for many of the state's most vulnerable children and teens. By attending Sweet & Savory, you're showing these kids the community they live in cares about them. You're showing them hope for a brighter future. Help us celebrate the last 40 years and 7,000 children and teens who called Palmetto Place home, and help us look forward to new possibilities and the next 7,000 children to call our house home. If you are a chef interested in competing in Sweet & Savory please email grace@palmettoplaceshelter.org for more information. Haynsworth Sinkler and Boyd, P.A. Comer Distributing Company, founded 1971, in Rock Hill, SC by H. Leon Comer Sr. Our initial products were from Jos. Schlitz Brewing Co., but over the 45 years in business several other major domestic, imported, and craft brands have been added to the portfolio, along with additional territories. Servicing several counties in the Upstate and Midlands, Comer Distributing takes great pride in service and excellence, and in exceeding all expectations of our customers and suppliers. Topper’s Rhum- Locally Owned and Imported into the USA - Handmade in St. Maarten - The World’s Best Tasting, Award Winning, Premium Rhum. Our events are nothing without our sponsors. If you are interested in sponsoring this event please email grace@palmettoplaceshelter.org for more information. Jacquelyn McHugh - Jacquelyn is the owner and Editor-in-Chief of Edible Charleston & Edible Columbia. She received her degrees in Sports Medicine & Nutrition, all the while spending almost 10 years in the food & beverage industry. Her experience in Hospitality and Wellness paved the way for her to ‘make the world a better place’ through food and education. As a mother of two young boys, sharing the importance of sustainability and wholesome food has become her priority, and through Edible she embraces the opportunity to share this vision with the Lowcountry & Midlands. Elizabeth McHugh - Elizabeth is the Director of Sales at Edible Charleston & Edible Columbia. Working in restaurants the past 5 years and growing up with a Greek mother, she adopted a love for food and all things tasty. Her background in psychology, neuroscience and health & wellness coaching fuels her passion for creating community, especially in regards to good food, understanding where it comes from, and creating the relationships to foster this. Ron McHugh- Weighing in at 260lbs with over 25 years of eating experience, Ron brings an eclectic palate to the table (literally). With 10 years in the hospitality industry, he has had the opportunity to experience a variety of cuisines globally. As a former chef, Ron specializes in traditional American fare. His favorite dish to savor is a cheeseburger with crinkle cut fries. Currently, Ron spends time in his own kitchen while supporting Edible Charleston and Edible Columbia in various capacities. December is such a fun month! The kids have plans to go ice skating (if it cools off! ), build gingerbread houses, decorate for Christmas, and make new holiday memories. It can also be a hard month emotionally for our kids. Some of them miss family and friends this time of year. Some of our younger kids don't know if Santa will find them at Palmetto Place and some of the older kids realize they don't have the same experiences as you and your family. But we're working to make sure the holidays are special and magical for each of our kids. Thank you to everyone who is collecting items from our Holiday Wish List. Your donations will help keep the shelter stocked well beyond Christmas. There are a few needs that aren't on that list. Can you help us collect these items? Using Your IRA as "A Charitable Vehicle"
In 2015,the Protecting Americans from Tax Hikes (PATH) Act became law, and among the beneficiaries were charitable Americans age 70½ or older and their favorite charities. Now the IRA Charitable Rollover provision is permanent, allowing individuals who have reached age 70½ to donate up to $100,000 each year to charitable organizations directly from their Individual Retirement Account (IRA), without treating the distribution as taxable income. Using IRA assets to make a gift during your lifetime, as opposed to giving via bequest in your will, enables you to experience the joy of making a major gift. Need ideas on where to give? The Community Foundation staff is just a phone call away at 803.978.7831 to help you learn how an IRA Charitable Rollover can help reduce your taxable income and fulfill your charitable goals. This blog was written and shared by the Central Carolina Community Foundation.